If you thrive on challenge, then earning the Supernova award will be right up your alley. To be eligible, you must be a First Class Scout or higher. As a prerequisite, you must first earn any three of the four Nova awards for Boy Scouts. With your parent's and unit leader's help, you must select a council-approved mentor who is a registered Scouter. You may NOT choose your parent or your unit leader (unless the mentor is working with more than one youth). 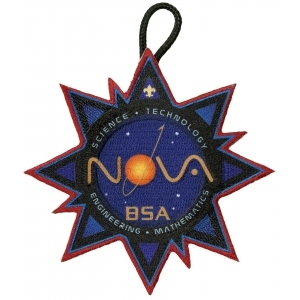 The Boy Scout Supernova awards recognize superior achievement by a Boy Scout in the fields of science, technology, engineering, and mathematics (STEM). All experiments or projects should be conducted using the highest level of safety protocol and always under the supervision of a qualified, responsible adult. The Scout should always have a buddy when meeting with his counselor or mentor. The following requirements apply to any specific topic chosen by a Boy Scout in the course of completing a Supernova award. Each STEM field - science, technology, engineering, mathematics - offers a choice of three Supernova activity topics (listed below). These are two-part, hands-on, high-level activities created to challenge you and help you continue along your STEM journey to excellence. Part 1 involves research, preparation, set up, coordination, and/or organization. Part 2 includes elements such as analysis, reflection, experimentation, design, or invention, and culminates in a report created by you. No matter what STEM activity you choose, you will need to create a report. Reports are a regular part of the work of professionals in STEM fields, so this will be good preparation for future career demands. Notice it doesn't say write a report. You are not restricted to just writing a report, although you may choose to do so if you like. Any report will probably involve some writing, but the report itself may be created and presented in any number of ways. Use your imagination! For details on the topics, requirements for the research required and lists of suggested resources available, see the links below. If you are fascinated by how things work and you want to help contribute to a better planet Earth, the Supernova activity topic choices for science give you a hands-on chance to reduce your environmental impact on Earth, explore the wonders of space technology, or see why carbonation and candy create an explosive experiment. Choose any one of these activities and discover how it drives your imagination, your curiosity, and your fascination with science. From the energy that keeps our homes comfortable and our lights on, to the communication that lets us talk to people around the world, to the special effects used in the movies, we depend on technology. Choose any one of the following projects and you will have fun while learning about today's technology. Have you ever watched bungee jumpers and wondered why they don't hit the ground? You can make a model of your own and figure it out. Or, what about the Yellowstone geyser Old Faithful - how can you tell when it will erupt? What about voting - can you imagine how so many people in so many states can go in, cast a vote, and come out with a fair result? Mathematics is the key. Choose any one of these projects to learn how it's done.